So here is Part II of my California vacation. My husband, my friend Samar, and I took a full day to drive out to the Joshua Tree National Park while we were staying out in Palm Springs. 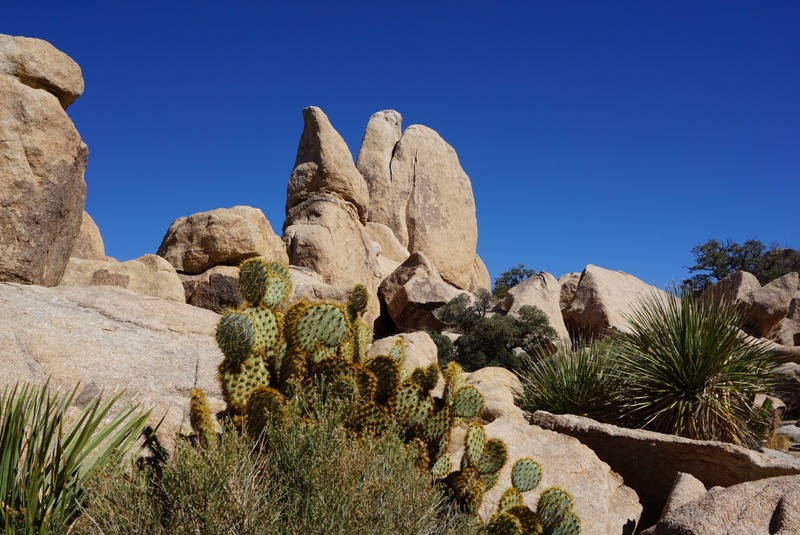 I’ve seen lots of desert photography featured prominently in many stylish homes on Pinterest and in magazines. Now I was finally getting the chance to shoot my very own art/vacation photos in the desert, and I could not wait for the chance. I never really visited the desert before. I mean, sure, I went to Las Vegas once for a work convention, but I am not sure taking a shuttle from a hotel on the Vegas strip to the convention center counts as actually visiting the desert. 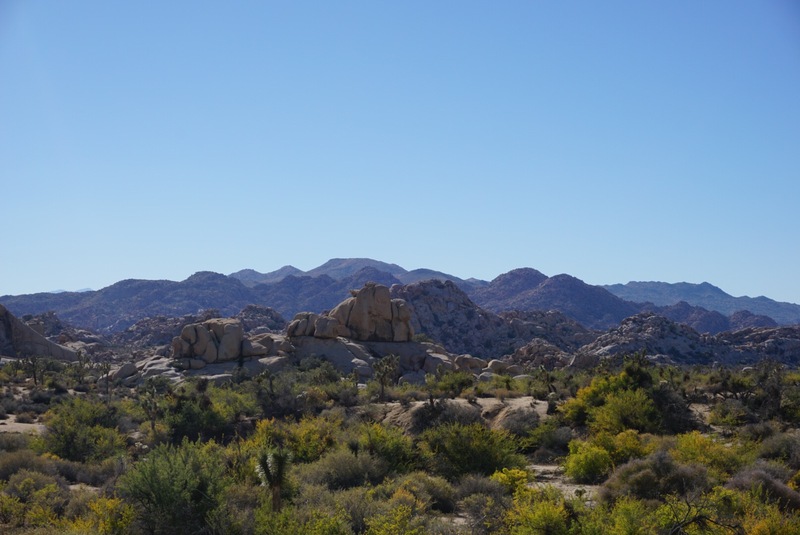 So I really did not know exactly what to expect from my visit to the national park where the Mojave and Colorado deserts merge, but I could not wait to get there. 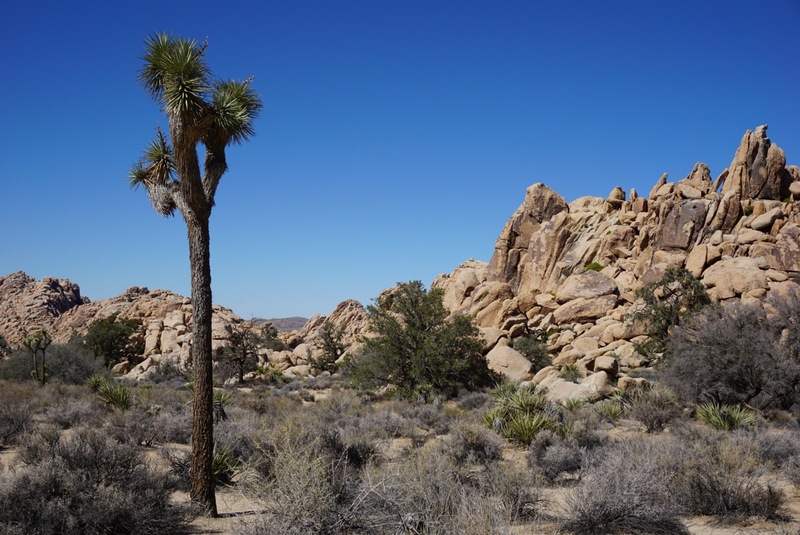 A lone Joshua Tree stands out in the rocky landscape. Climbing around on the rocks near Skull Rock. Unfortunately, I realized in our hotel room the morning we were supposed to leave for the park that I forgot to pack my contacts. I wear daily deposable lenses, and I had already disposed of my lenses the night before. Fine, I will wear my glasses to the park. Oh wait, I forgot to pack those too. Let me just tell you, I am blind without my contacts or glasses. 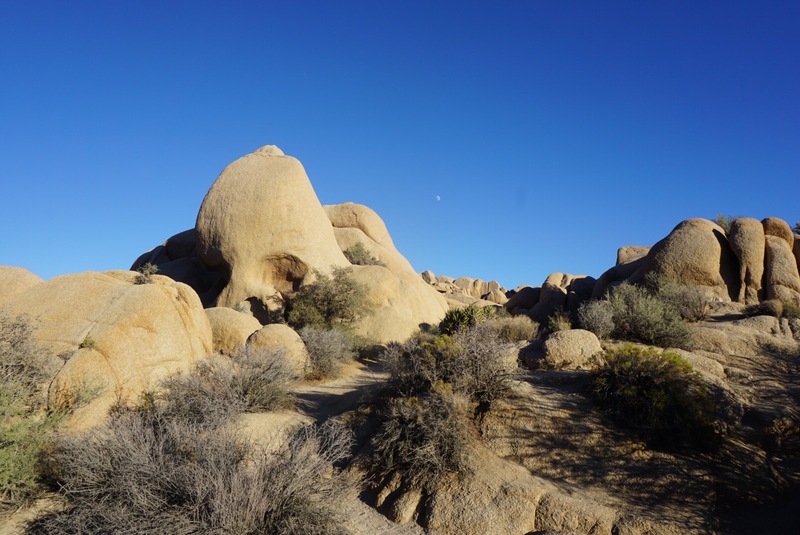 I really did not want to have distorted vision and the associated accompanying headache on the day I visited Joshua Tree. Luckily, it was a weekday so I was able to have my optometrist back home fax a new contact lens prescription to a local optometrist who sold me a new pair. All it took was a 20 minute detour and $80 (for a 90 day supply), and I could see clearly! It really was an easy fix, but I know I got lucky that it was a Tuesday and not a Sunday when their offices would have been closed. 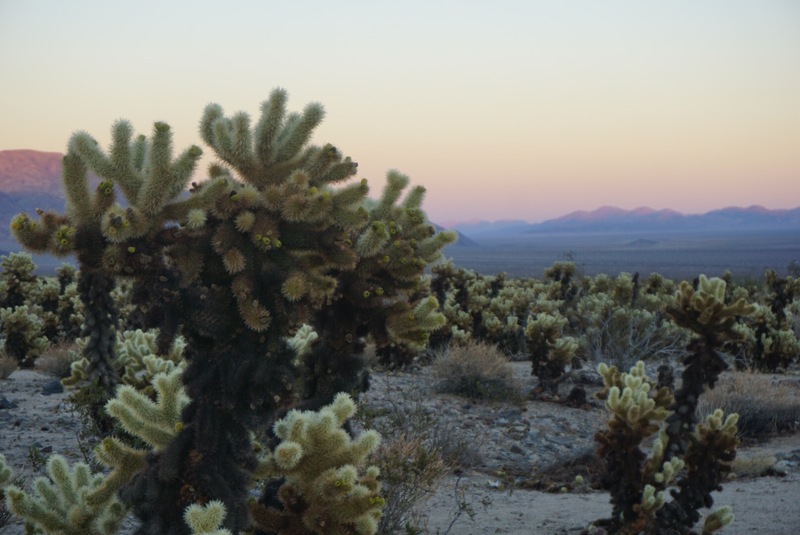 The cholla cactus garden seemed to glow at dusk. The landscape changes very quickly as you travel across the park. The diversity of vegetation is incredible. Thank goodness I got my peepers working. 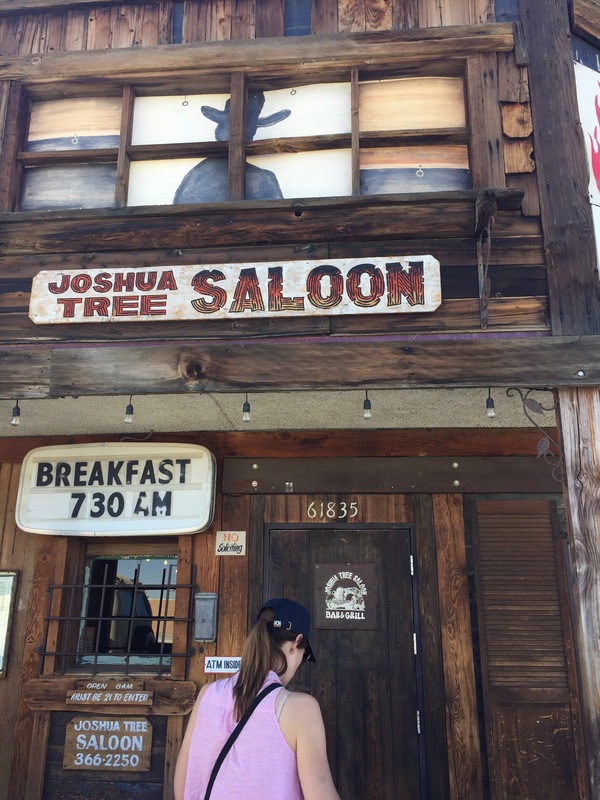 Before we entered the park, we stopped at the Joshua Tree Saloon for some grub. We were told Pappy and Harriet’s was a really cool place to check out too in Pioneertown, but they were closed on Tuesdays. And guess who happened to be playing a surprise concert there the night before? Entering the Joshua Tree Saloon where you can have a good burger and a Sioux City sarsaparilla, but no Paul McCartney. Yeah, we missed out on that. I guess he decided to tack on that appearance after playing at Oldchella over the weekend. Crazy, right? I think over 2,000 people showed up to see him, but only 300 people were actually allowed in. In any case, the locals tell us that the food at Pappy and Harriet’s is pretty good, but the burgers at the Joshua Tree Saloon were delicious too. If it weren’t for the car and my friend off in the distance of this photo, this picture might have ended up hanging on my living room wall. The sky was so clear and blue on the day we were there. The park was so stunning and beautiful, and we really had an amazing day. This really was one of the best days of the whole trip for me, because we really got to wander around and explore the whole day. We started at the northeastern entrance to the park and followed Park Boulevard, all the way through the park until it ended at Pinto Basin Road and exited the park at the southern side. The whole drive was only about 56 miles, but we stopped to do some of the easier hikes, take pictures, and enjoy some of the scenic spots. I would say we spent about 8 or 9 hours in the park exploring everything, and we loved every minute of it! Skull Rock and the moon rising in the distance. I think my favorite part of the day was at Skull Rock. 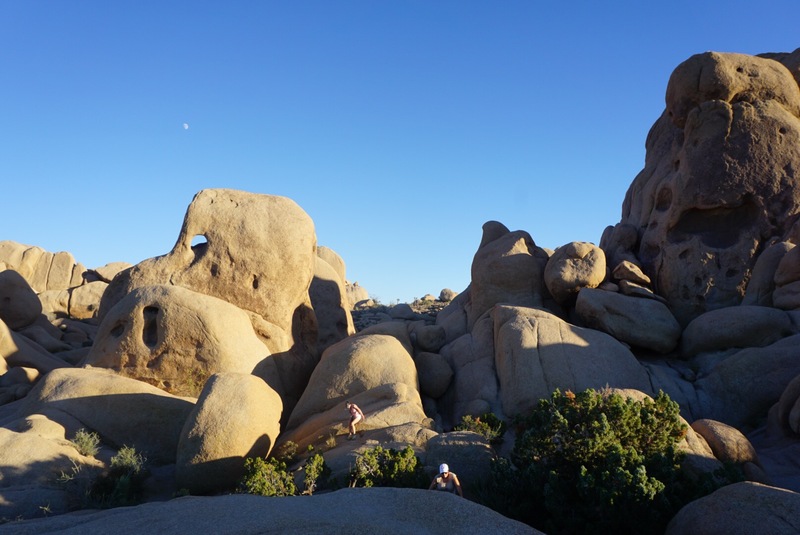 We just started wandering around climbing over boulders and sneaking through the crevices in the rocks out there. It was late in the afternoon, and the light was starting to soften. The scenery reminded me of Bedrock, from the Flintstones, and Tatooine, from Star Wars. It was just so cool to be outside and climb around the rocks and hang out. It really seemed like we were worlds away from anything else, despite that we were maybe half a mile away from the car as the crow flies. I felt like a kid just running around outside playing without a care in the world. 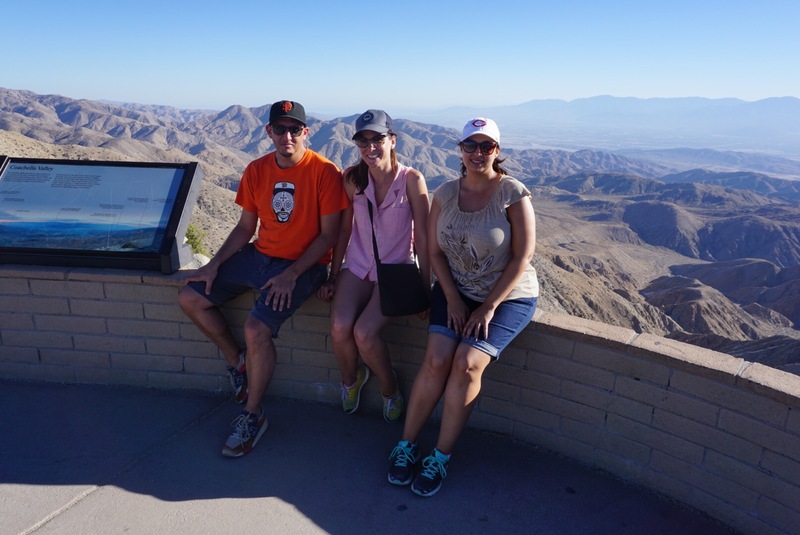 Posing for a group photo at Keys View which overlooks the Coachella Valley and the San Andreas Fault line.